We always hope that our working relationship with clients brings them success. So we were delighted to hear that Camel Valley Vineyard – a client of Campden BRI – had won an International Wine Challenge Trophy, beating over 450 competitor products including many Champagne 'giants'. Its victory, in the sparkling rosé wine category, is the first ever by an English wine. 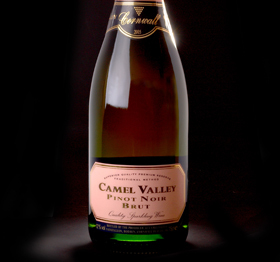 "We have been a customer of Campden BRI since we first made sparkling wine 15 years ago. We utilise every aspect of the Campden BRI service: wine analysis, advice, and consultancy. From when the grapes are picked to when the wine is released for sale, Campden BRI will analyse the wines and give recommendations on how to proceed, depending on the results. Campden BRI is also on hand to give us advice on how to deal with the variability of the grapes, and on fermentation issues right through to bottling procedures. All this helps to preserve the special qualities that the English climate produces and makes award winning wines of international acclaim." "The rationale behind all of this is optimisation of quality at point of sale. The advice we have given for this winning wine is an accumulation of knowledge over several years and in several stages. First, the base wine is produced; this needs to have certain flavour, colour and analytical profiles on which to build other flavours. The second stage is the secondary fermentation in bottle to produce the pressure (bubbles), then ageing on the lees ( yeast cells) for a minimum of 9 months. This produces what are termed yeast autolysis characteristics. Logically the longer you leave it, the more this character is obvious, but you don't want too much, so timing is crucial. The final stages are riddling, disgorging, adding the dosage (a sugar solution) to ensure that the flavour balance is harmonious, and corking. A further period of resting is advised to ensure the flavours are integrated. All of these stages have an impact in terms of quality and timing is crucial. Camel Valley has been really successful over the last few years, and we are delighted to have been able to help them achieve their aims and objectives in producing high-quality English wines." To hear Geoff Taylor talking about wine quality and problem troubleshooting, listen to his podcast or visit our wine analysis service page for information.